St John’s church and Syed Shah Mustafa Jama Masjid in Aberdeen to be one and the same. 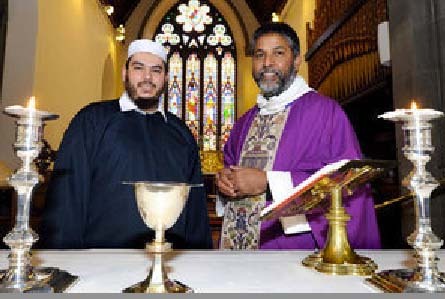 An Imam will soon pray to this altar of priest Isaac Poobalan in Aberdeen. Setting an example of religious coexistence, a Scottish church has become the first in the United Kingdom to share its premises with Muslims to help them perform their daily prayers. “Religion does not play a role when it comes to friendship and hospitality,” the rector of St John’s church, Rev Isaac Poobalan told The Guardian. The Syed Shah Mustafa Jama Masjid in Aberdeen has become unable to accommodate the growing numbers of worshippers, leaving many Muslims to pray in the streets. This prompted St. John’s church officials to offer help to Muslims to perform their religious duties. “If they all squeezed in very tightly about 60 or 70 people could fit inside,” said Poobolan. Since Islam says: “allah” have no son equal to Him self, this “god” can simply not be the God of the Bible. Because Father, Son and Holy Spirit is One God. Equally God. The Bible speaks about “gods” that are not “gods” at all, but demons. To permit Muslims to pray inside Churches, is of no use for the Kingdom of Heaven. And since their “allah” is no “god” at all, they invite deceptive spirits to enter both buildings and hearts. In an eternal perspective, this is a punishable crime. Those who indulge in this, will not escape judgment. He replied, “Isaiah was right when he prophesied about you hypocrites; as it is written: “‘These people honor me with their lips, but their hearts are far from me. People are lead astray, and into the eternal fire of Hell. Blessed by the Anglican priests and bishops, who have permitted this falsehood to take place. If they do not repent, they will share the same destiny as the Muslims they have invited. Reblogged this on Countdown To Eternity. The bible speaks of many false prophets in the endtimes. We need to be very discerning as to were we are being led, it could be straight to hell. Don’t be deceived! That socalled Christian seems not to know or does not want to know that muslims kill Christians whenever they can. Seems not wanting to know what hapens in Africa. He is already a dhimmi. One day a muslim will cut his head off. Never compromise your faith in the Lord Jesus Christ. Inviting the enemy into the camp of Christianity is dangerous. But I would question how Christian is this Anglican Church in Scotland? Do they fully believe in the Gospel of the Lord? Or are they involved with the traditions of men like the RCC is? Pertinent and straight to the point questions. That is so wrong. Why does this anglican person preach the gospel to muslims instead of incouragiing it. Like the author said They must repent and turn to Jesus or perish it is that simple. Come Lord Jesus Come.